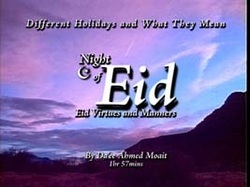 Some people describe Eid as a feast, wearing new clothes, going out and enjoying their day. Eid in Arabic means the day of happiness. Many Muslims celebrate this day without knowing the purpose and the meaning of it; they do not know the reason for their happiness and joy. Muslims need to ponder upon what it is they are doing to serve Allah SWT that they are happy about? 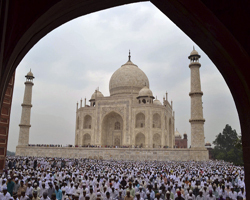 Muslims have two days of celebration during the year, Eid Al-Fitr and Eid Al-Adha. The Eid after Ramadan is a gift of Allah and an outpour of mercy, pleasure, bounty and forgiveness from Allah SWT towards us. We have one full month of work for Allah SWT and on this day it is for us to collect our gift and our reward. Thus, we celebrate what Allah SWT allowed us to have (ie. iman, ability to fast, to pray and to remember Him). Hence, we are in a state of thanking the Creator. 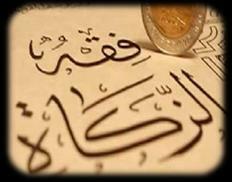 It has another name in the kingdom of Allah SWT known as Yawm-ul-Ja-izah, (the day of gift). Therefore, this day holds great spiritual importance. When one goes out of the home to Eid salah there are angels present making dua’a, making dhikr, and recording the names and steps of the attendees to be presented to Allah SWT. He SWT showers us with mercy and love, which spreads among us. Only if we understood the magnitude of this day, we would not stop praising and thanking Allah SWT! 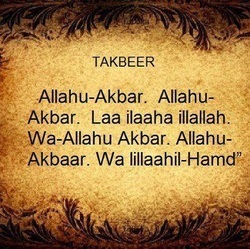 As soon as one finds out the day of Eid they should start saying takbirat. Another purpose of this gathering is to demonstrate to everyone the unity of Muslims and the bounty of Islam. It is a time for Muslims to feel the joy of being united and to build strength, and to generate mercy to each other by giving charity before the prayer. That’s why it is recommended to delay Eid-ul Fitr until Zakat-ul-Fitr is given to the needy Muslims so they can join the ummah in the celebrations. Can you see the bounty of Islam? Closer to the end of time Allah will kill the hearts of the people. People will be living but they will lose the ability to see, comprehend and understand the purpose of creation. Those who illuminate the night of Eid, Allah SWT will keep their hearts alive when the majority of hearts are dead. Oh Allah forgive me and my parents, and have mercy on them as they have taken care of me when I was a child. Because the night of Eid is a chance to gain the pleasure of Allah SWT, one should illuminate it with maximum amount of takbirat, dhikr, recitation of Quran, and remembrance of Allah SWT. Islam is not just worship five times a day and fasting, it is a complete way of life. We are slaves of Allah SWT and we must acquire knowledge about the Islamic sunnah and etiquettes related to different situations and occasions. We have certain duties on the day of Eid such as visiting our relative’s and the sick in the community, making efforts to join heart with those we dislike or don’t get along with, take initiatives to forgive others for the sake of Allah SWT. It is also recommended to visit the dead at the cemetery and make dua’a for them. It is also a moral duty to share what Allah SWT has given us with those around us, especially the underprivileged. This is an occasion to make peace with each other and create unity. It is almost as if the guests take away our garbage of sins on their way out. But these gatherings cannot just be an eating affair. They have to have a purpose just like everything else in our lives. These should be the occasions of remembering Allah SWT and strengthening our Iman and the bond of brotherhood. The house that has a gathering for the sake of Allah SWT is illuminated and rewarded. 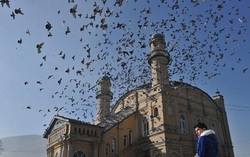 Some traditions related to Prophet Muhammad SAW suggest that from 70,000 to 100, 000 come and make dua’a for the host. If unable to invite a large crowd, you can do this with your family; have a gathering with a few people and spread the name of Allah SWT, do dhikr, spreadgoodness and earn this reward. The key factor here is generosity. Allah SWT wants us to emulate His qualities and among them the most loved quality is generosity and kindness. The one who makes an effort to serve others with humility earns the reward of all those who are involved. Allah SWT loves those who are weak in worship, but strong in generosity, and hates those who worship a lot but are stingy with people and in spending for the sake of Allah SWT. Allah SWT advises us to spend so that our hearts can be cleansed from the diseases such as stinginess, greed, jealousy etc. Today, look at the Muslims, we hardly find a family that loves each other and has peace among each other, especially after the parents pass away. 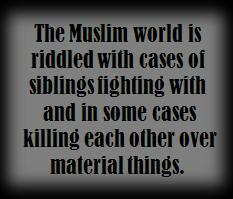 Muslim world is riddled with cases of siblings fighting with and in some cases killing each other over material things. 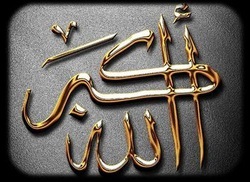 It is a calamity from Allah SWT because we are so much in love with our duniya. We disobey Allah SWT and focus all our energies on the things that Allah hates the most. Allah SWT tells us that this life is only for a short period of time and our real abode is paradise—a reward for our struggles in this world. But our behavior and actions show as if we do not want the paradise and would rather live with luxury in this transient world, instead of working hard for the akhirah which is everlasting. Sometimes we need an accident, a calamity or a bad situation to wake up from our slumber and get closer to Allah SWT. Why can’t we go to Him with ease? If we have Allah SWT with us then there is no topic we should be overwhelmed with since Allah SWT is the owner of security, tranquility, peace and of all things. The happy one is the one who tries to please Allah SWT, and only these people can be happy on the day of Eid and will be able to truly make Takbirat and say Allah-hu- Akbar from their hearts. 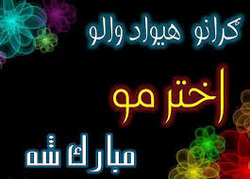 It is allowed to celebrate on the day of Eid by playing or reciting good poems and Islamic songs. Again, the purpose of these songs should be to generate love and closeness to Allah SWT. Islam discourages the use of string instruments so only the daf (drum) should be played, it is better to avoid all other instruments. The condition of the Muslims has become such that we eagerly await the end of Ramadan and the coming of Eid al-Fitr to gain ‘freedom’ in order to go back to committing sin and disobeying Almighty Allah. 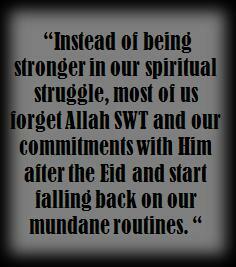 Instead of being stronger in our spiritual struggle, most of us forget Allah SWT and our commitments with Him after the Eid and start falling back on our mundane routines. If we can’t celebrate this day the way Allah SWT would like us to, we have already failed the chance given to us during Ramadan of renewal of faith and gaining closeness of Allah SWT. What is the purpose of any worship in Islam? It is to increase our obedience of Allah since this is what we will be graded on, on the Day of Judgment. We have to keep the purpose of this celebration alive in our hearts, minds and our practices. Our focus shouldn’t be on how many dishes to make nor which dresses to wear. Our happiness or sense of celebration shouldn’t depend on how many houses we visit and what kind of sweets we eat, rather our happiness should be directly related to our remembrance of Allah and the remembrance of the condition of other Muslims. We should remember our less unfortunate brothers and sisters, both in money and in spirituality. We should be busy thinking about and praying to leave behind a good legacy, to gain His mercy and forgiveness, and ultimately the happiness of entering Jannah. Upon leaving Ramadan our behavior and actions should be more humble and God conscious. The mercy, tranquility, peace and love that we have gained between us and Allah SWT should be carried over to others throughout the whole year InshaAllah. Ramadan was a rehab center for us to clean our dirty heart and it is important that we give thanks to Allah SWT for giving us another chance and beg Him to give us the gift of meeting him with a clean heart—a heart full of mercy and love for the ummah, for each other and for entire humanity.